Synopsis For Marvel’s Shattered Empire Released! 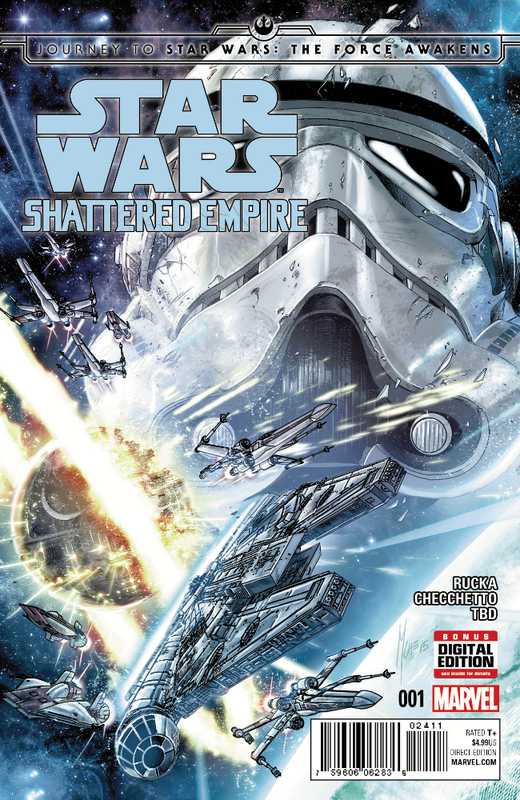 As reported over at Jedi-Bibliothek, PREVIEWSworld has revealed a synopsis for Marvel’s Shattered Empire miniseries, which will launch this September as one of the story-driven parts of the “Journey to Star Wars: The Force Awakens”. It offers some new details on the immediate aftermath of Return of the Jedi. In December, a new chapter in the Star Wars saga will begin when Star Wars: The Force Awakens — the seventh Star Wars film and the first to take place after Return of the Jedi — arrives in theaters. As the excitement for the new film builds, Lucasfilm and its partners will explore the aftermath of Return of the Jedi in a series of canonical projects debuting in September, and Marvel Comics leads the way with Greg Rucka and Marco Checchetto’s Star Wars: Journey to The Force Awakens: Shattered Empire #1!Emperor Palpatine’s twenty-year reign of terror came to an abrupt and fiery end in the skies above the forest moon of Endor. A decisive victory for the Rebel Alliance, to be sure, but even with the loss of its leadership, the Empire’s Moffs and regional governors retained their hold on important systems from the Core to the Outer Rim, thanks to the might of the Imperial Starfleet. Now, with a power vacuum atop the Empire, those Moffs will jockey for position and control, and the heroes of the Rebel Alliance will soon discover that a wounded and fractious Empire may be more dangerous than any threat they faced before! Greg Rucka, the acclaimed writer of Wolverine and Cyclops, reteams with his collaborator on The Punisher, Marco Checchetto, for a Star Wars tale that will reveal the untold story of the aftermath of the Battle of Endor and the political machinations that ensued. The Rebellion’s desperate struggle to liberate the galaxy from the Empire’s tyranny will face new challenges, and Rucka and Checchetto will bring their incisive storytelling to a story that no Star Wars fan will want to miss. A new addition to the Star Wars canon, Star Wars: Journey to The Force Awakens: Shattered Empire will take readers into uncharted territory and set the groundwork for the new Star Wars film. Put your Empire Strikes Back soundtrack in the stereo and cue up “The Imperial March” when you read Rucka and Checchetto’s Star Wars: Journey to The Force Awakens: Shattered Empire #1 this September! Doesn’t sound too different from the Legends stories, but as we all know, the differences will come sooner rather than later.